How to prepare for a Career Fair? Looking for a full-time job? Kick start your career journey with a career fair - where you can meet your future employers face-to-face and be exposed to a wide variety of job openings and in-depth career advice. A good start will be the upcoming STJobs Career & Development Fair. If you are still unsure why you should go to a career fair and what you should do at a career fair, fret not, because we have the answers to your doubts! 1. Should I attend a career fair? Study the career fair website and read about the employers who will be attending the career fair. Determine if the job opportunities available at the fair cater to your personal interests and goals. If you have more time, research about the participating employers to understand the hiring companies’ culture and working environment. If you find something that fits your dream job, then you should definitely attend the career fair! Even if the job openings are not exactly what you are looking for, take this as an opportunity to understand the job market and industry trends better. It is always good to be updated about the job market and stay relevant in your area of expertise. For fresh graduates or someone in between jobs, a career fair is definitely an excellent opportunity for you to keep a lookout for new jobs. With so many organisations across various industries, you will never know if you can land yourself a job unless you try. 2. What can I do at the career fair? At the career fair, you can learn more about various companies beyond the information that is available online. Find out more about the job and leave a good impression in person to your future employers that put you in a good stead for your job interviews. Besides finding job opportunities and engage in valuable 1-to-1 interaction with your employers, you can also find a suite of services that includes - grooming tips, building your resume and getting advice on how to advance in your career. In addition, there are seminar talks that you can attend to hear from industry experts like the U Future Leaders Summit 2016 (Jul). 3. What should I do before going to a career fair? Truth is, you may not have the opportunity to talk to every single employer. Hence, before you attend the career fair, do make sure that you have a certain goal in mind: Make a list of the attending employers whom you want to talk to. Have a brief idea of what these employers’ companies do and what they may be looking for in their employees. Prepare your resume. Gather your past working experiences or education background and skills that you have acquired and update your resume. Beef it up by writing a summary of yourself and your goals in life. Tailor your goals and career objectives to the targeted company’s vision. Print more than one copy of your resume and be prepared to present it to the employers at the career fair. Remember, make your resume simple and easy to understand, for employers usually only take a quick glance at it while talking to you. Prepare a short 30 seconds – 1 minute introduction of yourself to the employers. Do not make it too long and monotonous, for that would turn your employers off immediately. Make it short but impactful. You can include your name, majors, job positions that you are looking into, skills that are important for the position and why you are interested in joining the company. 4. What should I do at the career fair? First of all, dress like you would for a job interview. You do not want to appear in shabby or crumpled clothes that will make you forge a bad first impression to your future employers. Practise good manners and make basic formal greetings and handshakes. Maintain a calm and pleasant disposition and be clear and concise when you are introducing yourself. Be aware of your body language and keep a straight posture as you speak. Besides introducing yourself, you can show your employers what you already know about their companies. This helps them recognise that you have done your research well and is a promising candidate for job interviews. Be proactive and ask questions including information that cannot be found on the employer’s website, such as the kind of employees they are looking for, the companies’ working style and culture as well as the skills they require in their employees. Remember, be active, but not aggressive. Do not try too hard to sell yourself. That may equate to demonstrating an over-confidence in your own abilities. In addition, do not ask information that are too personal or that can be easily found online. Questions such as the salary and benefits the companies are offering are a STRAIGHT no-no. Make full use of the complementary services at the career fair! As aforementioned, there will usually be a wide range of services that will be offered at the career fair besides job opportunities. Take this chance to get groomed and ready for face-to-face interviews, enquire on tips to improve your resume and engage in 1-to-1 conversations with the career coaches who can offer you valuable advices on how to build a successful career. Such opportunities are hard to come by! 5. After the career fair, now what? If you are lucky, some employers may be interested to grant you a job interview. Apply and submit your job application online if you are requested to do so. In addition, you can also apply to the companies that you are interested in after getting the information you required from the career fair. Keep a look out on your inbox for invites to attend job interview. Last but not least, digest the information and career advices that you have obtained from various individuals at the fair and take the necessary actions to build your career. You will soon be on your way to a successful career! 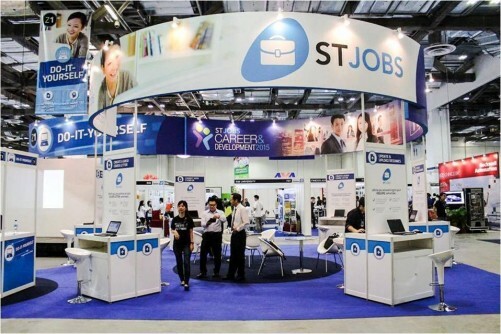 For more information about STJobs Career & Development Fair 2016, visit http://careerfair.stjobs.sg/fair2016 for more information.